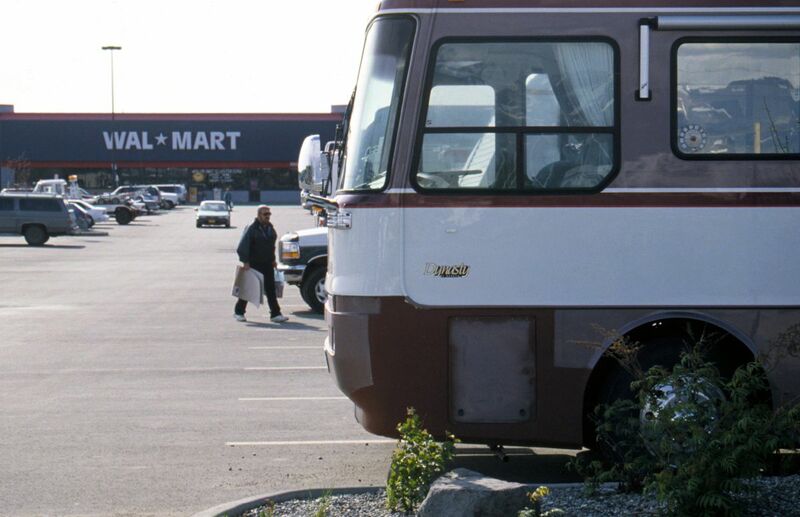 It didn't go over well when an Anchorage Assembly member tried to ban the practice of RV camping in parking lots of box stores like Wal-Mart and Fred Meyer last year. After a big uproar, Assemblywoman Elvi Gray-Jackson dropped her proposal, which appeared to be particularly unpopular among tourists. Now the idea's back — just from a different Assembly member. Gray-Jackson's colleague, freshman Assemblyman Eric Croft, is introducing an ordinance this week to ban all "overnight" parking of RVs, travel trailers and mobile homes in commercial and industrial lots, with the exception of dealerships or repair shops. The ordinance does not apply to residential areas, though it says visitors can only stay in RVs or motor homes for up to 90 days in a calendar year. "I'd like to have people parking in places that have the proper facilities for them," Croft said. "There's just better ways to do this." [Read a copy of Croft's proposal]. Croft said he himself had watched RVs park in the Wal-Mart parking lot over the years. But he said he also heard complaints from Lottie Michael, who owns Golden Nugget RV Park in the Russian Jack area. Michael also approached Elvi Gray-Jackson about the issue last year, which led Gray-Jackson to broach the idea of a parking lot camping ban in February 2016. Gray-Jackson's ordinance, which was never formally introduced to the Assembly, went further than Croft's. Her ordinance would have created a license for camping parks for recreational vehicles, require health and safety inspections, and set a $100 fine for anyone operating without a license. After an Alaska Dispatch News story on the proposal, Gray-Jackson said she received more calls and emails on her proposal than on any other issue in nearly three terms on the Assembly. She quickly scrapped it. One RV camper from Oklahoma emailed a reporter then to say that if the ordinance passed, he and his family would be spending "less time and money in Anchorage than in the past." Gray-Jackson said she advised Croft against repeating the idea. But it was his decision, she said. "I said, 'Do what you need to do, fella,'" Gray-Jackson said. Croft said he's prepared for controversy. He said the Assembly has dealt with plenty of other controversial topics lately, including sales taxes and water fluoridation. At an Assembly rules committee meeting last year on Gray-Jackson's ordinance, Scott Patton, then the marketing manager for Wal-Mart in Alaska, said Wal-Mart does not cater to RV campers. But Patton also said he was worried about the prospect of enforcing the new law and draining police resources. Darrell Wengler, marketing manager of outdoor recreation store Cabela's in South Anchorage, said in a phone interview Friday that Cabela's has a 24-hour policy on its parking spaces. Anything longer than that, and Cabela's prefers that the customer go to a long-term RV park, Wengler said. "For just an overnight stay … we have no problem with that," Wengler said. There's a separate area for RV's in the Cabela's parking lot, though the business does not offer sewage disposal or fresh water. Those needs will push longer-term customers to actual RV parks, Wengler said. "Since we don't have those, things will be done in the parking lot we don't approve of," Wengler said. Wengler said the vast majority of visitors don't end up staying the full night. Most park for three to four hours, then move on. He said store managers make a note in the morning of campers parked in the lot, and pass that information on to other store officials. Every so often, the store has to tell people to move, he said. But Wengler also said problems are rare. He said the 24-hour policy makes customer service sense for a national chain that caters to campers and travelers. Croft said he plans to send the ordinance to the city Planning and Zoning Commission, which holds public hearings on ordinances related to land-use law. Gray-Jackson said the ordinance would have a hearing before the Assembly in June at the earliest. Croft said he's open to making the law less restrictive, such as allowing 24-hour parking policies. The current version of his ordinance does not define the term "overnight" or set up enforcement guidelines. "I just don't want it to be lasting a long time without proper facilities," Croft said.